The Monroe County Transit Authority (The Pocono Pony) added a new bus route through East Stroudsburg. The new Green Line starts in Bartonsville, runs through downtown East Stroudsburg, past Pocono Medical Center and the medical offices along Rt. 447, ending in Eagle Valley. 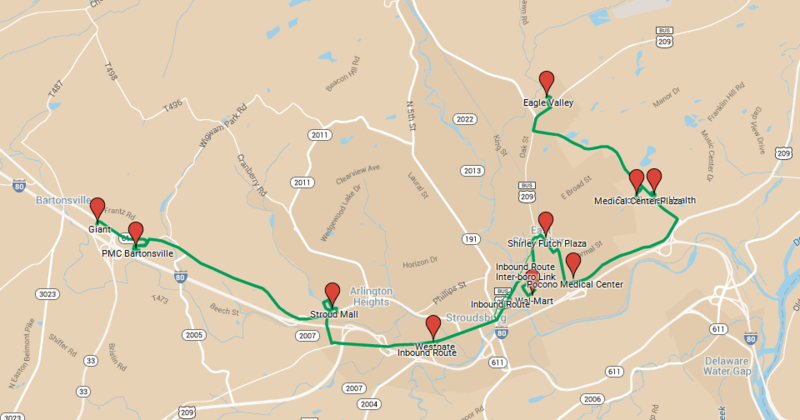 This bus route is the third serving East Stroudsburg, with the Red Line serving much of downtown and the University, and the Yellow Line offering connections in Eagle Valley. More mass-transit options are always welcome, reducing the need for a car, and making East Stroudsburg even more walkable. Posted in Bus, Featured, Local, Mass Transit on January 17, 2015 by wesadmin.